Preheat oven to 350 F. Line a muffin tin or spray with nonstick oil. 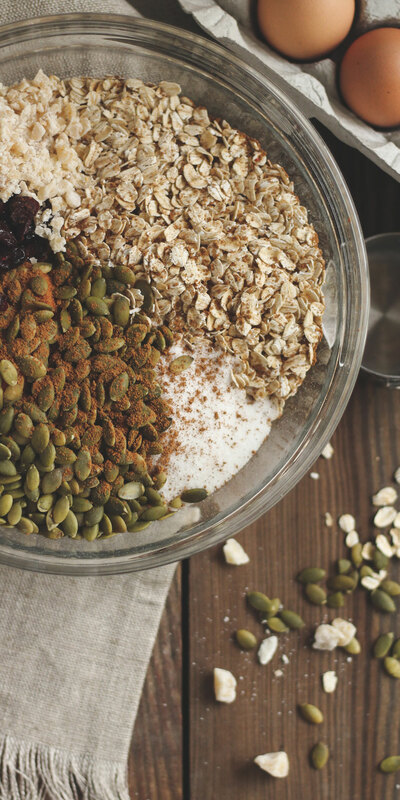 Add the dry ingredients (oats, sugar, cranberries, pumpkin seeds, ginger, baking powder, pumpkin pie spice, cinnamon and salt) to a large mixing bowl. Stir gently to combine, then spoon the pureed pumpkin into the mixing bowl. Prepare wet ingredients by combining eggs, milk and vanilla. Pour over the pumpkin-oat mixture and stir to combine. The batter should appear orange in color and very wet. Spoon the batter into the prepared muffin tin, distributing evenly. Top each muffin with additional cranberries and pumpkin seeds, if desired, and place on the middle rack of the oven. Bake 30 minutes, or until the tops begin to brown. Remove from the oven and allow to cool slightly before serving. To convert to an overnight oats recipe, omit the eggs. Instead of baking, transfer to clean, dry mason jars or other sealable containers. Chill overnight to enjoy the following day.